What do the icons in the Session History tab mean? How do I reject messages which were sent with an empty Mail From Header? How do I translate Icewarp reports into my own language? First of all, before starting migration process it is needed to read the guide on our website (http://dl.icewarp.com/documentation/server/tools/IceWarp_Migrator_Guide.pdf) by this guide you could find all aspects of migration process. In this KB article we will just cover some questions regarding the post migration steps, to restore target server. First of all what you need to know, the target server is stopped. This is done in similar manner as the source server stop. Modules are not stopped, but services are disabled. Because it is necessary to have RCP working, web is disabled using API variable of c_mail_control_disableweb, but c_mail_control_active remains enabled. Thus, there is a green circle in the config services list showing, that web is running. However only RCP is available – no HTTP service. This can be confusing for an admin that does not finish the migration and ends with disabled server. Web has to be re-enabled via API, in this case open API console from File > API console (or just shortcut Shift + Ctrl + A). 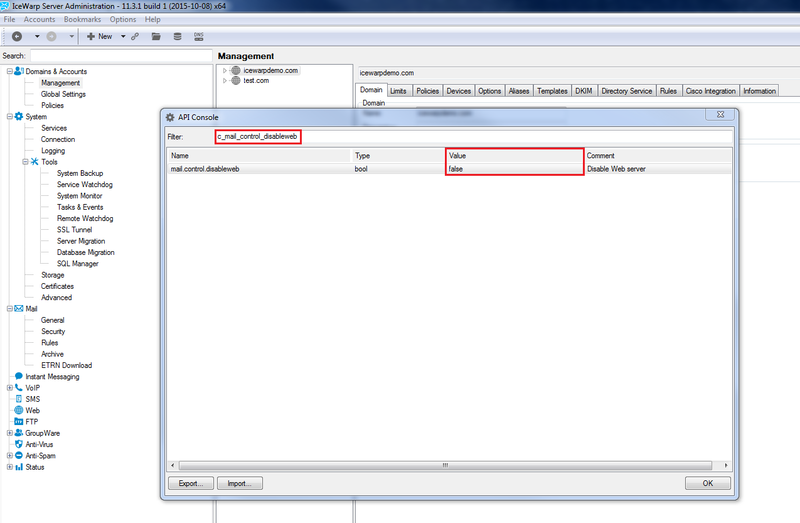 Type in filter c_mail_control_disableweb and change value from true to false, this will enable WebClient. Second step is testing the availability of features in WebClient. Try to create meeting in Calendar, send and receive message, create new Task. Also try to upload and create files in Documents. If you store data in MySQL, MS SQL, Oracle or another relational database management system, please make sure that all configurations in console for DB’s were correctly added at target server. How do I move/migrate Icewarp to a new server?